FREDERICTON, N.B. 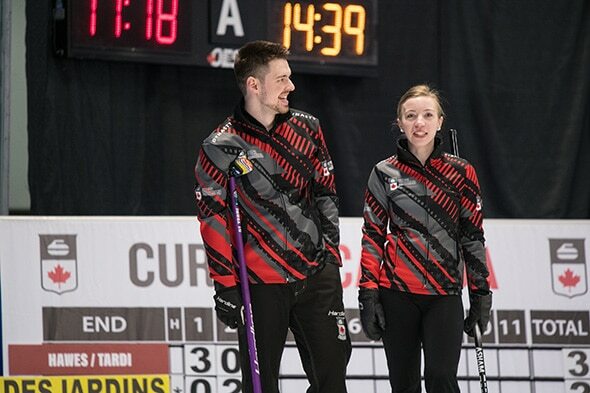 — It’s been a perfect 3-0 start for Laura Walker and Kirk Muyres at the 2019 Canadian Mixed Doubles Championship but there’s still room for improvement, according to the reigning national mixed doubles and world bronze-medallists. While the duo believe their game needs some small tweaks and adjustments, they’ve been putting themselves in positions to win early on. The duo defeated Nova Scotia’s Karlee Jones/Bruce Everist 7-3 and Alberta’s Chantelle Broderson/Kyler Kleibrink 8-3. Walker and Muyres faced their toughest test on Wednesday afternoon against Bobbie Sauder/Brendan Bottcher, who were also undefeated at the time. The duo took an 8-6 lead into the final end but gave up a deuce, sending the game into an extra end. Walker and Muyres took advantage of a miss, scoring three in the extra frame for an 11-8 win. By Wednesday night, eight other teams had perfect 3-0 records in addition to Walker/Muyres: Dezaray Hawes/Tyler Tardi, Jocelyn Peterman/Brett Gallant, Shannon Birchard/Catlin Schneider, Colton Lott/Kadriana Sahaidak, Nancy Martin/Tyrel Griffith, Jennifer Jones/Brent Laing, Jolene Campbell/John Morris and Danielle Schmeimann/Jason Ginter. 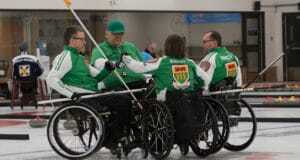 In 2018 Walker/Muyres surprised many with their run to the gold medal at the 2018 national championship in Leduc, Alta. Muyres said he saw themselves as ‘dark horses’ but doesn’t necessarily think the target is on their backs. With 32 teams in the mix, all it takes is a strong run of games to have a shot at winning the championship. His partner agrees. “It’s mixed doubles. I think anyone could be a dark horse,” Walker said. While the discipline can be unpredictable and with no clear front-runners in Fredericton yet, Walker and Muyres expect to be in the mix by the end of the event. 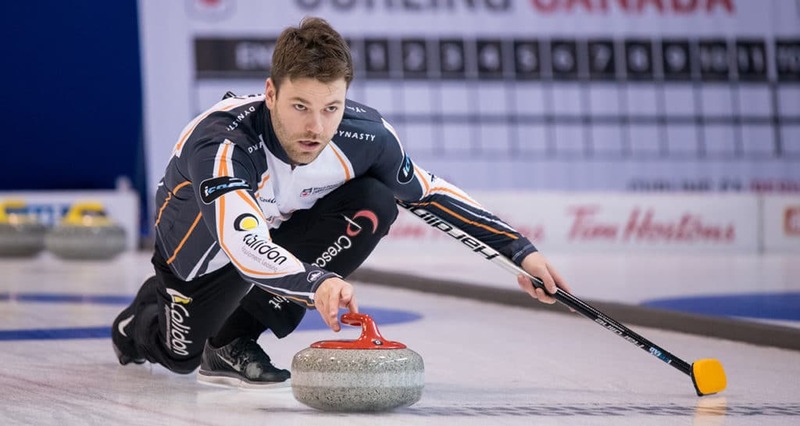 They each skip their own teams on the women’s and men’s circuits, with Walker leading a team at the 2018 Home Hardware Canada Cup and Muyres directing Saskatchewan to a 2019 Tim Hortons Brier Championship Pool appearance in Brandon, Man., two weeks ago. The pair believe that being skips with previous experience at other positions makes them a good fit for mixed doubles. “We’re so used to having to draw to win a game, draw to the four-foot and play big pressure shots. To take that mentality of a must-make and to put that into every single shot here is good for us,” Walker said. But being able to maintain the ability to produce strong and steady results while sweeping plays a big factor. It’s something that Muyres noticed since becoming a skip and hasn’t yet conditioned himself to the sweeping again, something he anticipates overcoming quickly. “I think that good mixed doubles players need to be versatile, whether you’re a skip or a lead or whatever position you play, if you can do it all – if you can sweep, if you can call line, do the strategy – then that’s what matters, not so much what position you’ve played in the past,” Walker said. Walker/Muyres will play two games on Thursday. They’ll take on Yukon’s Charmaine Thom/Greg Thom at 10 a.m. and New Brunswick’s Leah Thompson/Charlie Sullivan at 4 p.m. The 32 teams, a mix of provincial/territorial champions and CMDR teams, are divided into four pools of eight and play a round robin. The top 12 teams advance to a single-knockout playoff which culminates with the semifinals and final on Sunday March 24 at 10 a.m. and 3 p.m. (all time AST). 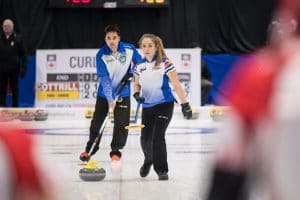 Play resumes on Wednesday with games at 10 a.m., 1 p.m., 4 p.m. and 7 p.m.
CBC Sports will live-stream select games and broadcast select playoff games, including the final, on CBC Television. 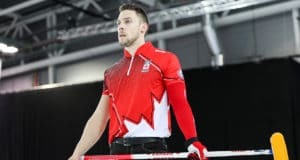 Go to http://www.cbc.ca/sports/olympics/winter/curling/broadcast for the schedule.